I have been running every other day for about a month and have made it to 5 miles. Should I work on running those 5 miles at a faster speed (I run it in about an hour) or should I run further and worry about speed later? My goal is to be able to run a marathon in about a year. Thank you for your running training question. I am happy to see you are taking a good year to prepare for the marathon, which is a tough, tough distance, even for seasoned runners. The general rule is: distance before speed. This is especially true when you are training for such a long-distance event. Getting your body used to longer distances via easy running has got an incredible effect on your cardiovascular system: your heart will become stronger and stronger. It will pump more blood to your muscles with every heart beat. This is exactly what those running muscles need to function when you are running. You need to build that strong foundation. If you do not have a strong foundation, then you will not be able to keep up the speed for a long time. Imagine if you could build up your longest run to 15 or 20 miles. Then how much easier would that 5-miler be? I bet you'd be able to run it a lot faster as well if you wanted to! 1) Be able to run 20 miles and do 20-mile training runs at least 4-5 times in your running training. 3) Lots and lots of easy running. 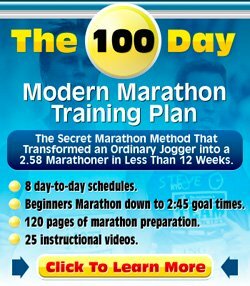 I can highly recommend getting a great marathon training book like Advanced Marathoning. It contains everything you need to know about running a marathon, including running program templates. A general running training book which is never far away from me is Daniels Running Formula which explains an incredible lot about running training and running program templates. If there is only one running training book you can buy, this would probably be the one. Enjoy your running and best of luck with accomplishing your marathon goal for next year.